Kitchens are the most important room in the house. Planning a new kitchen is a big job, with a big price tag – You will want to make sure you get it right from the outset! The most important thing to consider when planning your new kitchen is to be organised! Try to plan ahead, give yourself plenty of time so that you are not rushed into hasty, un-wise decisions. Kitchens can take 4 to 6 weeks to manufacture from the time you sign off your plan with a designer. Start a scrapbook of ideas, include articles and pictures of kitchens that appeal to you. Think about the style & colour schemes in the rest of your home and work towards incorporating design continuity with your kitchen choices. Think about the layout you want for your kitchen. Consider storage, bench space, and food preparation areas. Do you want your cabinets to go to the ceiling? Decide on a theme or an idea of the look you want – country, contemporary, retro, modern, minimal, or industrial. This helps with the selection of product materials and textures. Simple, classic, timeless design will appeal to most people. Avoid moving plumbing and electrical items if possible, at least try to keep the stove and sink in the same location. Moving a gas stove will require relocating gas lines, and a sink will involve moving your plumbing which creates additional costs, and sometimes additional problems. Keeping your existing layout is always cheaper. Once you have a good idea of what you want, write up a detailed list of the work that needs to be done before your new kitchen can be installed. You don’t need to be technical, just get it all down on the list! For example: remove wall, relocate window, remove built in pantry, rip up old flooring, plaster and paint walls, install new light fittings, relocate or ad new power points …… You get the idea! 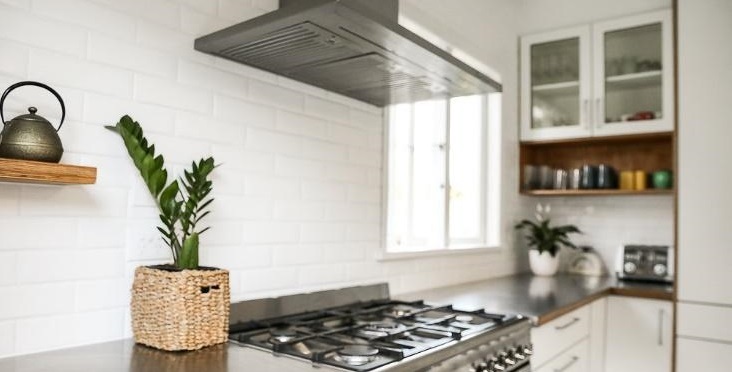 Kitchens can range in price from as little as $15,000 to upwards of $60,000 depending on several factors including, design, product & material choices, benchtops, and accessories. Always buy the best you can afford. Kitchens are used day in day out, so you will need hard wearing products and materials that will endure the test of time! The average cost of a new kitchen falls around the $25 to $45,000 range – depending on the above listed factors and of course the size of your kitchen. Let’s say your total budget is $40,000. 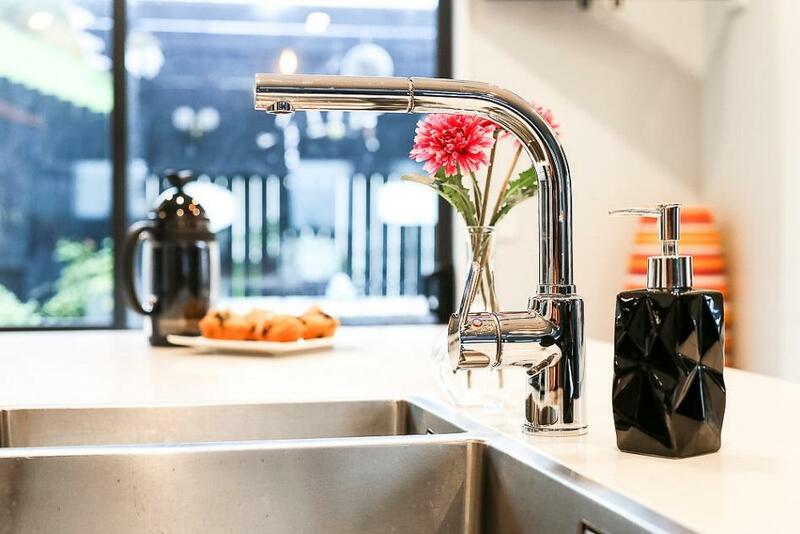 You need to factor in all the incidental costs involved in the renovation process: plumber, electrician, painter, plasterer, lighting, flooring, splashbacks, sink & tap ware and new appliances. When you factor in all these hidden costs, this could leave you with say, approx. $20,000 for the actual kitchen cabinetry & benchtop. So, start with your total available budget and work backwards from there. Let your designer know what your budget is, so they can incorporate it in the quote and select the best quality products for your money. Is your old kitchen and/or appliances worth selling? You can list them on Trade Me. You will be surprised how many people buy second hand kitchens for their batch, or young couples for their first home. Any spare cash can go towards your new kitchen – Every little helps! The shape of your existing kitchen usually dictates which layout is most appropriate. However, a good designer may often suggest alternative layouts to improve the overall function and practicality of the design. If you have a small kitchen, it makes sense to consider smaller size appliances as opposed to large French door fridges and double size ovens. Large appliances can over power the design, and take up valuable bench and storage space. Consider taking your cabinetry full height to the ceiling if extra storage space is needed. Think about everything you store in the kitchen; dinnerware, serving bowls, coffee machine, small appliances, jug & toaster etc and plan your design to include room for everything. Visualise where you will keep everything. If you have big appliances for example, make sure you tell your designer so the cupboards can be custom made to fit! There are many different products available for you to select from. Prices will vary depending on the material and finish you choose for your kitchen doors and drawer fronts. Melamine is a common & affordable material widely used in NZ kitchens. Other options include, laser edged melamine, thermal wrapped vinyl (where the material is vacuumed onto the face of the door and drawers and can incorporate patterns as per the example here) or spray painted lacquered two pot paint finish (which is generally a more expensive option) Most options are available in a gloss or matt finish. Timber veneer or solid wood is another higher priced option. Cabinet components such as hinges, drawer systems and storage accessories will add to the bottom line cost. There are vast variances in quality & functionality so make sure to look into these details early on with your designer to make sure they fit in your overall budget. Benchtop materials vary in price from mid-range to high end. 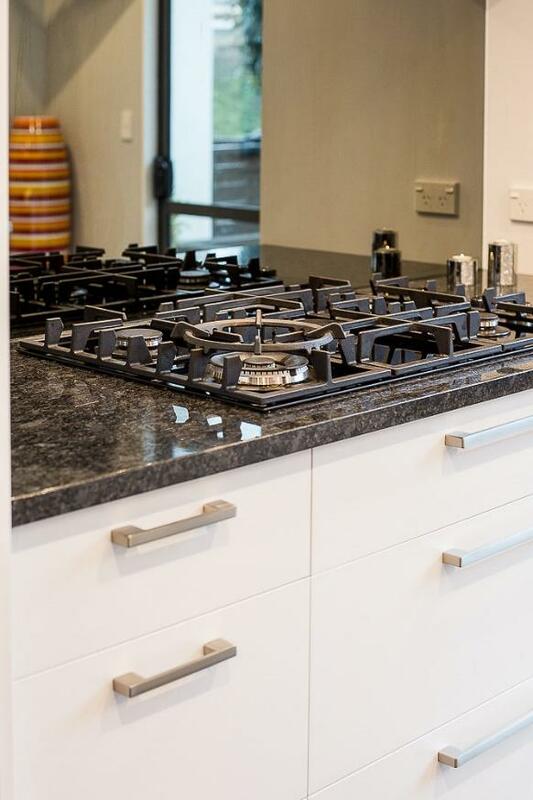 Often the benchtop will be the most expensive component in the kitchen design. Granite is the most common type of natural stone for benchtops and is known for its natural beauty. Because it is a natural product there are huge variations in colour, texture and pattern. Granite is a porous stone and normally darker in colour making them harder to keep clean and streak free. Because of the natural divots and fissures in granite counters, they can be more prone to cracking or chipping. If you want the feel of granite but want a lower maintenance option with a uniform appearance, then go for man-made engineered stone. It is a man-made composite material with a mix of quartz and a resin compound formed under high pressure, making it strong and durable. Engineered stone is non porous and antibacterial, and comes in a wide range of colours and finishes, usually lighter colours than granite. Engineered stone is harder and heavier than granite. Acrylic benchtops give a seamless finish with no visible joins and they can be repaired or buffed up again to look as good as new. Made from moulded acrylic resin, these surfaces are hygienic and durable and can be made into any thickness, shape or length. Moulded sinks can also be added without joins. Plain white acrylics are generally at the cheaper end of the scale, while those with graining or other textures are more costly. Choosing the correct accessories is vital to the way your kitchen functions. A well placed internal drawer, pull out storage unit, or hideaway rubbish bins makes a good design even better in terms of practicality. Think about the size of your sink. Do you want a single sink, or double sink? Do you want a waste-master? Make sure your main sink is big enough to fit large pots and roasting pans with ease! Choose the best quality tapware you can afford! No point having a stunning new shiny kitchen, only to finish it off with a cheap looking tap fitting. When choosing your cupboards & drawer handles, think about matching them with the same style, shape and colour as the handles on your oven and/or fridge. Consider the size of the handles. If you choose big chunky handles, they will become a focal point/ feature of your kitchen. Alternatively, if you choose a subtle, simple handle they will blend into the background.